If you’ve been following along, then you know I am a bit behind on delivering Build 43 to First Access backers. There are a few reasons for that (which I’ll get to) but I wanted to take a little time today to show you some of the progress that’s been made so far and reset expectations for the upcoming schedule. The writing team and I have made some great progress on the encounter system, which is injecting a ton of world building flavor into the game. We’ve got a great system that lets you balance risk/reward much better than the previous system, while really delivering on an “anything can happen” tension to each individual encounter. Just trying to avoid an encounter will not guarantee no battle or negative outcome. It’s pretty exciting to see it in action. 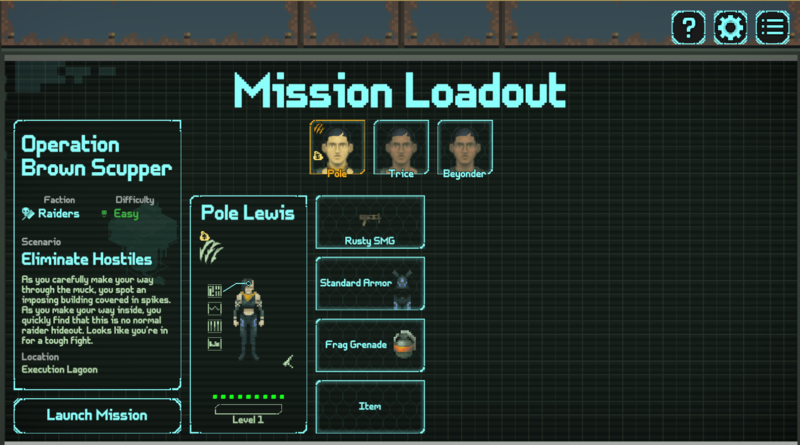 Major progress has also been made on updating the menus in the mission screens. The screens are much more consistent in style and appearance, more polished and I’ve made liberal use the new character portraits our artist has been working on for a while (they look amazing). I’ve also really upgraded the objective selection screens. It’s much more intuitive to navigate through them (I think) and the objective loadout screen gives a lot more info than the previous iteration. 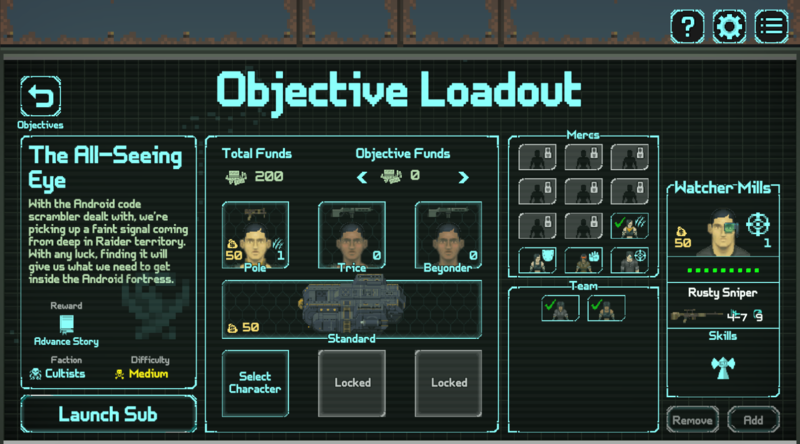 While navigating the sub around the map, I’ve added a Mission Loadout screen between the encounter and the battle to give you a chance to see some details of the scenario and adjust your equipment or perform a level up before you start the tactical encounter. Now that this is in place, I can’t imagine why I didn’t have it before! Total miss on my part but this greatly increases the tactical options available. 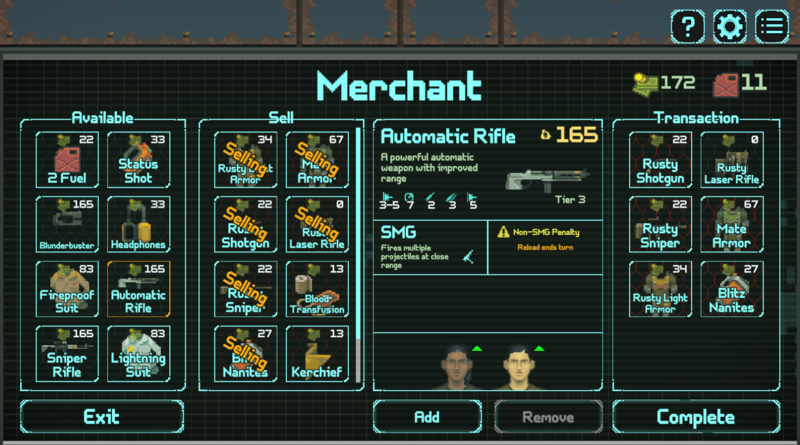 Merchant screens also got an upgrade and now you can clearly see what characters would get an upgrade from a piece of equipment. We’ve got a lot more new stuff in Build 43 but I have to save something for the next DevLog! What’s keeping me from delivering the build today? Mostly just bugs from changing so much of the back end encounters and objective/mission structure. I’ve also not got the story missions totally in place and am planning to change the tutorial mission. 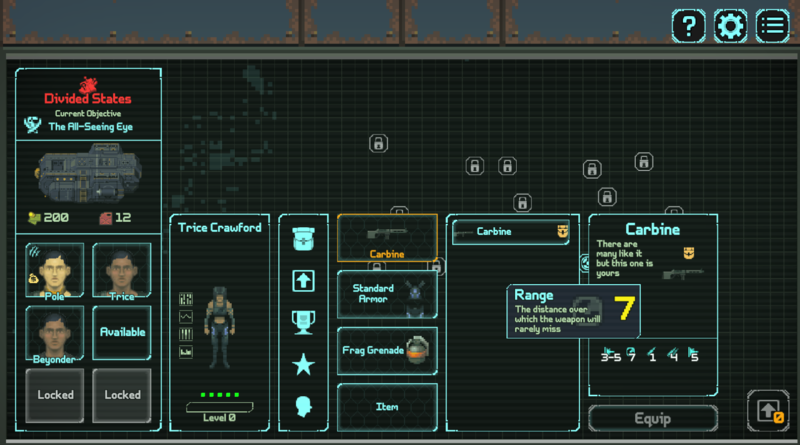 Plus a little bit more polish on various elements such as adding the portraits to the tactical HUD. It’s looking like I will split what I had planned for Build 44 into two smaller builds (44 and 45) and then push back the launch about a month. I know this is disappointing to a lot of you since we thought the game would be ready in August, but there are some good reasons to delay! First of all, the amazing tactics game Phantom Doctrine (the follow-up to Hard West) is planning to launch on August 14 so it seems smart to not be in the same window. I've also been putting in so many hours lately that I was feeling a bit burnt out, so my wife and I took a few days off this week to recuperate. I think it's important to stay healthy and crunching to get the game out sooner doesn't seem to be the right call for us. Hopefully you all understand. I feel pretty good about the dates below but everything in game dev always takes longer than you think! Adding that extra build gives us more opportunity to get your feedback on the game also and try to assure that the launch build is fairly solid. i hate to ask, but when are first access keys being sent out? soon. just trying to fix bugs. almost. in a few hours i think.